From the original IDT operator interface systems introduced back in the 1970's to the very popular PanelMate® Power Pro and ePro PS series of products today, Eaton Operator Interface products provide the best value on the market. Their features, hardware design, development software, and high quality are unmatched in the marketplace. The PanelMate Power Pro is the latest and most advanced member of the PanelMate family that is a direct descendent and fully compatible with all PanelMates that have come before it. Touchpanel for all models include a display with electronics module and membrane keypad with off-screen 3 x 5 cell control selection, cancel key and numeric entry keypad, with four redefinable membrane control buttons to the right of the display. 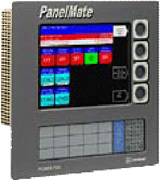 The PanelMate 5000 units have five membrane control buttons.